Asim is a hands-on technologist with a special talent for recognizing and delivering on opportunities that help his clients make money, save money or simplify business. 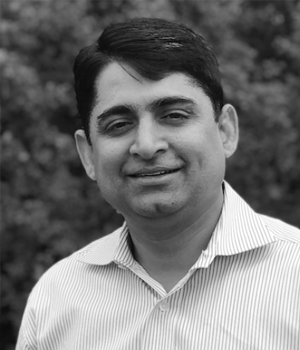 With over 20 years’ experience in the IT industry, Asim has relied on the principles of Agile, Lean Six Sigma and CMMi to help drive product and process innovation. Beginning his career as a programmer for Patni Computer Systems (now part of Capgemini), Asim rose to head up the company’s largest business unit. Before joining Nexient, he managed enterprise data warehouse and business intelligence systems for one of America’s largest hedge fund administrators. His experience working on both the provider and buyer (CIO/CTO) side of technology services has given him a 360° perspective on IT’s challenges and opportunities in many industries. Asim has an academic interest in Big Data and Analytics, and shares his passion by volunteering for JerseySTEM, a non-profit focused on increasing access, quality and diversity in science and technology education. He also runs the Garden State Scrum User Group (GSSUG) for Scrum Alliance. He is a big fan of sci-fi and animation movies, and enjoys watching football, basketball and tennis.